amethyst and australian opal white topaz ring | For Frock's Sake! March 27, 2014 180 × 174 About For Frock’s Sake! 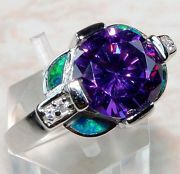 Amethyst, Australian Opal and white topaz ring. Check out The Store for this ring and other lovely items for sale.